Unfortunately the grey weather and need to be asleep for most of the weekend means that there's no fashion or lifestyle post this week. I can't be the only one who's struggling to leave their warm cosy bed every morning. I can totally see why hedgehogs hibernate during the winter, it just makes total sense. However I do love putting together these little Instagram round ups, they're not my most popular posts but they're one of my favourites to write. I think it's a lovely way to see what you've been up to in the last few months and remind you of all of the fun things you've done. Which meant that I was reminded of my wonderful trip to New York, I'm desperately wishing I was back there. New York in autumn just seems to be the perfect time to visit. The weather is still a little warm, they go Halloween mad during October, there's not quite as many tourists, Central Park is beginning to shed its leaves for winter and let's not forget the Columbus Day sales! The rest of my photos are a little round up of my Autumn so far, it's all looking pretty cosy, which is just the way I like it. One of my favourite things about the end of the year is all of the fun things I get up to with my friends. It's the perfect excuse to find a great table, order some amazing food and have a good giggle over a drink or two. If all else fails, I revert to my teenage years and have a sleepover, which is where I was treated to these amazing pancakes from Liv. I also don't post many photos of myself on Instagram (unless I've published a blog post) but I wanted to share this one on Instagram as I was really pleased with how the whole blog post came out, if you missed it you can take a little look here! 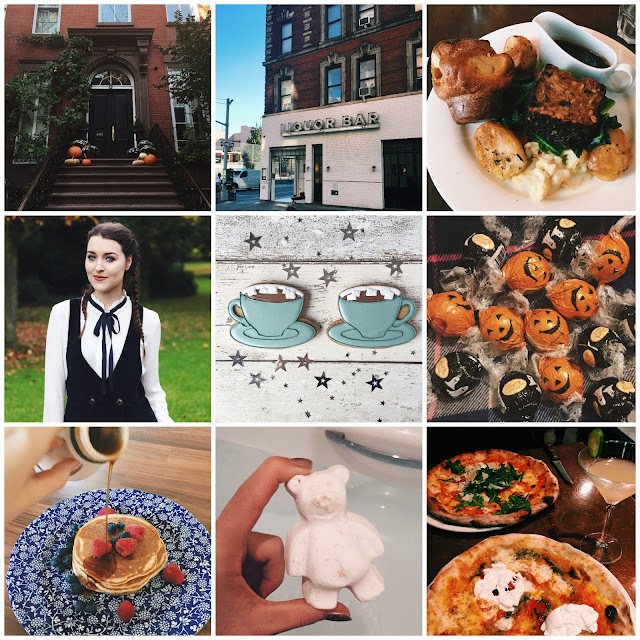 If you don't already, you can follow my Instagram @iamdaisyalice for plenty of more of the above! Love these photos, so cute! Don't worry you're definitely not the only one who's struggling to stay awake at times! It must be the clocks going backwards that make us so tired. This roast dinner looks so good! New York must have looked amazing especially during Halloween time, anyways the first photo does look quite festive! It's so hard, I just want to be snuggled in bed all the time. Thank you for the lovely comment! These photos are sooo lovely. I've definitely followed you on Instagram!